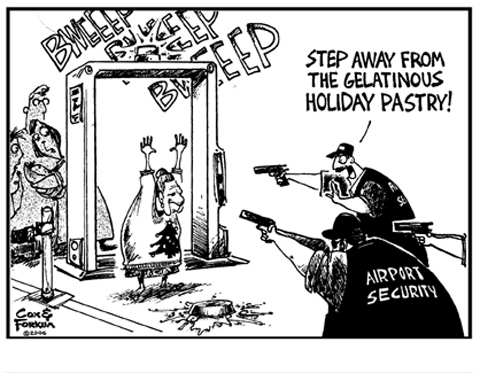 Obviously, Grandma Hortense did not read the sign that Figgy Pudding has to be cut up into portions less than 3 ounces each and placed into quart-sized ziploc bags before going through security. I travel on average about one week per month. This month 3-weeks. Love this cartoon John! Makes a good statement. But, and there is always a But. I'm really tired of being guilty until proven innocent. My mother 82, who has an artificial knee has now said "fu$%k it, I'm not traveling. They sell "souvenirs" (food products, sauces, drinks, etc.) in foreign airports AFTER the security checkpoints (so the only way to get them on the plane is to carry them on). There's no problem boarding--even with multiple large containers. However--if these same people fly into a U.S. airport & have to switch to a connecting flight, they have to deal with U.S. authorities who confiscate darned near EVERYTHING because [they claim] THEY don't know that the "contraband" was properly cleared. How hard is it to verify & coordinate a uniform security protocol? We all know the U.S. "officials" are using this as an excuse to confiscate & abscond with all kinds of "free" loot. Bake some extra tasty goodies, lace them with something odorless & tasteless that causes extreme gastrointestinal distress & projectile diarrhea, pack them in extra large containers, & let the screeners confiscate them. Any screeners (or any screeners with family members) who come down with these symptoms are immediately deployed to Pockyston. * In memory of Laban Johnson, an amiable PBS nut-ball who really cracked me up. We just got back from a trip to Europe. I can relate! Since TSA took over, I've refused to fly. If enough people finally decide that this farce has gone too far AND REFUSE TO FLY, the airlines would be on their knees in one or two weeks. Let's face it. Most air travel is not life-or-death necessary. Money - or the lack of it coming into the airlines - TALKS! This page contains a single entry from the blog posted on October 7, 2011 12:11 PM. The previous post in this blog was Wayback Machine: September 25, 2007. The next post in this blog is Wayback Machine: November 26, 2006.